SOUTH WINDSOR, Conn. -- Students at Pleasant Valley Elementary School are being asked this month to perform 26 acts of kindness, but many have no idea why. That's by design. Pleasant Valley is among many schools in Connecticut and beyond that have embraced the tradition as a way to honor the 20 children and six educators gunned down three years ago at Sandy Hook Elementary School, some 50 miles away from this Hartford suburb. Many students in elementary school today are too young to have learned about the shooting. And for now, they don't need to know, said Pleasant Valley Principal Tiffany Caouette. "The important message that we want kids to take forward isn't necessarily that this came out of a tragedy," she said. "That's important for us as adults to know. It's important for the kids to know that they are just doing something good for somebody else." The Sandy Hook gunman, Adam Lanza, killed his mother and shot his way into the school on the morning of Dec. 14, 2012, carried out the rampage and killed himself. Afterward, people took to social media to promote the idea of doing 26 acts of kindness to celebrate the lives of the victims and see something positive come from the tragedy. Three years later the idea endures. 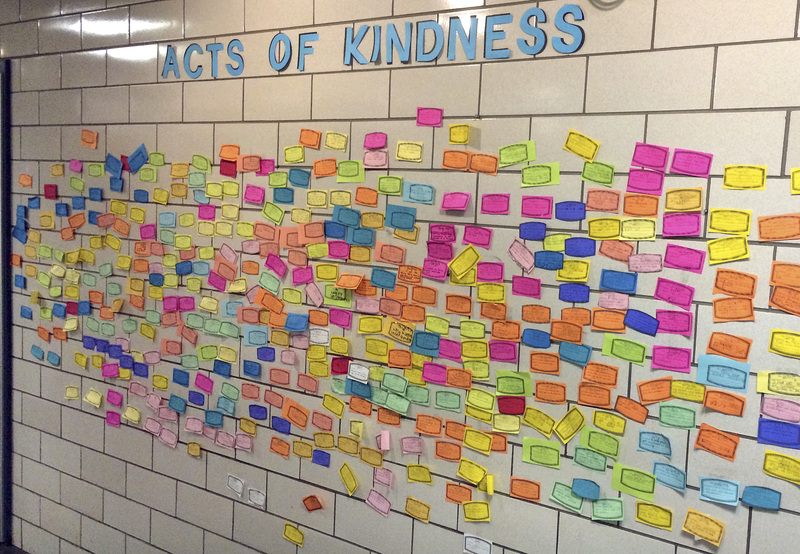 At the Pleasant Valley school in the Hartford suburb of South Windsor, children write about their good deeds on slips of paper on a hallway wall. Since the middle of November, more than 200 acts have been posted on the wall. Older children are doing things like raking a neighbor's yard. One child wrote that she copied homework assignments down for a sick friend. A younger child wrote he shared his dessert with his little brother. One quiet little girl stopped another child from picking on a classmate, telling her to be nice, Caouette said. "I don't know if this gave her the incentive to say something, where she wouldn't have otherwise," she said. "But I know she felt acknowledged because she did it." The school also is having children read 26 books, and in the spring they each will be encouraged to run 26 miles in small increments. Warren Tidwell, 37, of Auburn, Alabama, created a "26 Acts of Kindness" Facebook page the day after the shooting. He gave away a box of chocolates to a stranger as his first act. Others followed suit, posting on the page about paying the bill for the person behind them in line at the drive-thru or donating money to a scholarship fund. The Facebook page is currently honoring all of those who died in the Sandy Hook shooting with stories and photos of all 26 victims. Schools across the country have written to him, telling him of projects similar to the one at Pleasant Valley. They say there is less bullying as a result, and as children receive validation for their acts, a culture of kindness has grown. "It wasn't meant for people to forever dwell on the tragedy," he said. "It was a catalyst meant to help people think about being kind daily. So, now if people are just being kind to be kind. That's not a bad thing." Jennifer Ward, a teacher at Ionia High School in Michigan, said her students have been organizing food drives in the community as part of their 26 acts of kindness. "When students start to have conversations about what empathy is and what kindness means, that continues outside the classroom," Ward said. "Students have been talking about how they interact now in the hallways and address one another."